Seeing all those surviving old cars in the DOTS series, we sometimes need to remember that some survivors end up getting junked even after nearly 50 years of service. 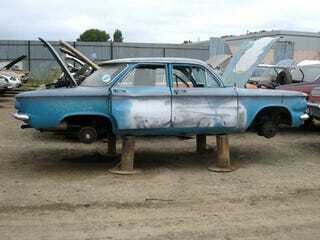 Take, for example, this '60 Corvair I spotted in an East Bay self-service wrecking yard. Someone's grabbed the steering wheel and glovebox lid, but the instrument cluster and plenty of other interior goodies remain. 1960 was the first year for the Corvair; this car managed to weather the Nader era (cursed be his name! saith the Corvair fanatics) and decades of driving beyond that before meeting its junkyard fate. The air-cooled pancake six is still there... hmm, maybe someone will buy it and put it in a Beetle! GM had big dreams of the Corvair being their Falcon-crushing economy car for many years to come, but those dreams got Fiero-ized (several Fieros await their date with The Crusher a few rows over from this car).